The non-profit Mars One organization wants to send a lander to the Red Planet in 2018. The lander will have seven different science payloads, and people everywhere can submit their ideas to the organization now. The nonprofit organization that has raised eyebrows with its plans to send people on a one-way mission to Mars is now accepting proposals for scientific payloads that could fly aboard an unmanned mission to the Red Planet in 2018. The Netherlands-based Mars One foundation aims to send a total of seven payloads: four demonstration payloads, one payload selected in a worldwide university competition and two payloads for sale to the highest bidder. Mars One is asking for input from the scientific community in order to source the best ideas from around the world, Arno Wielders, co-founder and chief technical officer of Mars One, said in a statement. "The ideas that are adopted will not only be used on the lander in 2018, but will quite possibly provide the foundation for the first human colony on Mars," Wielders said. Mars One is expected to send these payloads aboard the lander that is scheduled to launch in August 2018 and will be built on the same platform used for NASA's 2007 Phoenix mission. Mars One and Lockheed Martin are partnering to develop a mission concept for the lander. The four demonstration payloads will test technologies needed for the permanent human settlement of Mars. 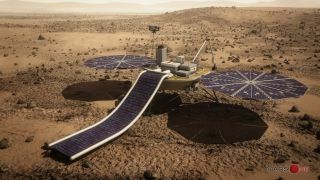 These will include an experiment to collect Martian soil for water production, an experiment to extract water from the soil, a thin-film solar panel for energy generation and a camera system that will interface with a Mars-synchronous communications satellite that will relay live video to Earth, according to Mars One. Mars One invites university teams from around the world to submit a proposal for a competition for the university payload. These proposals can be science experiments, technology demonstrations or "any other exciting idea," Mars One representatives said. Mars One applicants and followers will help vote to select the winning payload. "The brightest young minds of our planet are being invited to participate in Mars One's first Mars lander," Bas Lansdorp, co-founder and CEO of Mars One, said in a statement. "We're not only looking for scientific proposals but also for outreach or educational ones." In addition to the demonstration payloads and the university payload, Mars One plans to fly two payloads purchased by the highest bidder. These could be science or technology experiments, marketing and publicity campaigns or anything else, the organizers said. Previous Mars missions have only sent payloads selected by NASA to the Red Planet, Lansdorp said, whereas Mars One hopes "to open up the opportunity to the entire world," he said. The nonprofit has released a request for proposals and proposal information package, which include the schedule for selection of the payloads and information about the proposals. Mars One will work closely with Lockheed Martin and other advisers to evaluate and select the payloads that will be flown in 2018, organizers said.